Over the recent years my relationship with Jesus Christ has gotten stronger everyday. 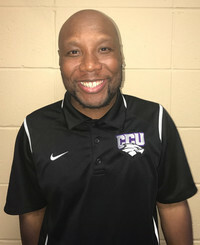 I thank him so much for giving me an opportunity to coach college baseball as well as learning and evolving as a young coach in the game under the tutelage of a veteran and head baseball coach John Taylor at Cincinnati Christian University. I can honestly say since being here at CCU and living in the beautiful city of Cincinnati, Ohio I really enjoy it and looking forward to continue helping to build and mold our program to where we as a staff desire for it to be. As the lead recruiter on staff, I constantly stay busy scouting evaluating and recruiting. Recently I was at The Cincy Flame Showcase tournament as well as the Big Southfield Showcase in Detroit, MI and came across so many good young talent players. Overall I am very optimistic about the directon our program is going. We compete in a very competitive conference which is the River State Conference, so every day we are out working hard as a staff preparing and putting the right pieces together in our program to become an established contender in our conference. The incoming talent we have coming in is very good with a lot of potential as well. CCU is a great University, we take pride in feeding our athletes spiritually as well as making sure they excel consistently in the classroom and on the baseball field. I see alot of me in my players that I coach and mentor, they kinda remind me of me when I was young and that is why I strive to make sure they are doing the right things and making smart decisions on and off the baseball field. I also try to give back within the community whenever I have free time and go out to speak to underprivileged kid's in the jail system and in schools to give them hope and encouragement and urging them to put Jesus Christ first and trust in Him in all the things they do as well as sharing my story with them letting them know that I was blessed with a second chance. I made the most of it and my hard work is starting to pay off. When they get a second chance take it and run with it because everyone doesn't get a second chance. My goal is to obviously win a conference and national championship and keep growing and excelling in my career but most importantly continue to grow spiritually and keep leading by example in a positive way. Growing up in the inner city of Milwaukee, WI, I was a young boy that always went to church and always stayed out of trouble. I used to always carry my glove and ball everywhere I went. I had dreams like every other kid in my neighborhood. Back then I used to see a lot of things and witness violence and poverty but I kept my baseball glove close, practicing every chance I got to get away from the bad things that used to go on. I got on my little knees and prayed every single night praying and talking to the Lord asking him to keep me and my family safe from harm and danger. As time passed, I got older and played 4 years of high school baseball learning and being a student of the game. Even though I was not the greatest player or most talented, I developed a strong work ethic as well as a high baseball IQ. I never really played college baseball but I had a couple of workouts instead and I attended many camps and summer combines networking with different players, coaches, and scouts. Once I got to be in my mid 20s I started to go astray and I started to become somebody I wasn't, somebody I didn't even know who I was at the time. I became lost, naïve, stubborn and immature as well as dishonest and egotistical. I even started to stay out all night and was surrounded by so many outsiders and outside influences that never meant me any good. One day I had a sports advisor who represented me for a while and I became too much for myself to the point where I thought I had arrived too early. I ended up providing the sports advisor with inaccurate information and documentation that led to me being in handcuffs and charged with theft of misrepresentation. I was young but it was that day I was arrested and thrown in custody where I began to hear a voice, the Lord Jesus’ voice asking me, can I hear him now?...at that moment I dropped down on my knees in that jail cell and cried out to God, lifting my hands and praising Him, asking for His forgiveness and confessing all of my sins to Him. Everything, even secrets...from that day forward I gave to Christ. I gave my life to Christ completely and instead of doing things my way, I allowed the Lord to be the driver in the seat of my life. A few years later, I prayed and asked God what was it he wanted me to do and shortly after I had coaching on my mind, heart and spirit and began to network. I attended coaching clinics and really grew into the coaching profession. I told myself while looking at the man in the mirror, my focus is on teaching life lessons while mentoring and leading young men in the right path as well as making sure they put the Lord first while having a backup plan. Today I am proud of the God fearing man I have become and happy to be engaged soon to a beautiful woman of God who shares the same faith I do. As a coach, mentor, and teacher I have a strong passion to do the right things but also keep young men on the right track.